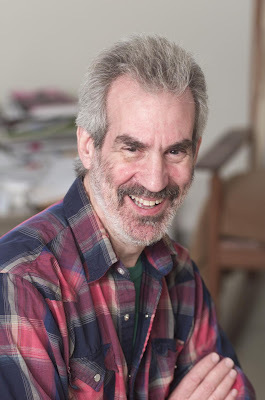 Dave Margoshes is a poet and fiction writer who lives in Regina whose stories and poems are widely published in literary magazines and anthologies throughout North America, including six times in the Best Canadian Stories volumes. Last fall, he was a finalist for the Journey Prize. His Bix’s Trumpet and Other Stories was named Book of the Year at the 2007 Saskatchewan Book Awards. A new collection of poetry, The Horse Knows the Way, was published last fall by Buschek Books; and another, Dimensions of an Orchard, his fifth, will be out this spring from Black Moss. Hey, that’s 3 distinct questions. This 20 questions or 22? The arrival of my first book, 23 years ago, coincided with my leaving newspaper work and moving to Saskatchewan. All of a sudden I was a “full-time writer” – a life-changer indeed. I started writing when I was a kid, a loner who lived inside my head a lot, inside my imagination. Story came first – I read them, and wrote them, mostly in my head, not on paper. I didn’t write my first poem until I was about 14 or 15. It had something to do with a girl. Things usually start quickly, then drag on. I’ll often write the first draft of a poem in minutes, a story in a day or two. But I’m a serious reviser, and that goes on for a long time, through multiple drafts, although not as many these days as years ago. I think of that quick first draft as art, the revisions as craft. Poems come from almost anywhere, sometimes just out of the ether, something I see or hear, often from reading or hearing someone else’s poem/poems – you know, art begets art. Stories usually begin with a character, an incident, I begin to follow a thread without any idea where it might lead. I rarely am working on a “book” (except when it’s a novel) – I write individual poems, individual stories; when I have enough of them, I start thinking about how they might come together as a book. I enjoy doing them – it’s contact with readers who are otherwise abstract and anonymous – but they play no role in my creative process, either pro or con. On the other hand, I rarely go to a poetry reading (and I go to a lot) at which I don’t scribble the beginnings of a poem. As I said above, art begets art, and that’s how it should be. Nope. I’m a poet who is not overly concerned with poetics. This is kind of an old-fashioned notion, I guess, but I see the writer (fiction writer, at least, and, to a large extent, the poet) as story teller, period. I don’t really subscribe to the “unacknowledged legislator” theory, appealing though it may be. I don’t approach my story-telling with any sort of message at all. On the other hand, I have, as do all writers, a certain world view, and it seeps into the work. I like working with a good editor. I think all work, any writer’s, can benefit from another pair of eyes. But I used to be a journalist, and editing is an essential part of that process, so I’m quite used to it. As a journalist, I certainly had my work edited by some butchers – I’m fortunate, I guess, that, in the book world, I haven’t run across any of those. I did hear this advice directly (and indirectly) and give it myself: read, read, read! I writer both fiction and poetry, and move easily back and forth – often working on both on the same day. I think of it as being fluently bilingual. That said, poetry is definitely “another language” (which is why some people have trouble reading it), so I guess fiction is my mother tongue, poetry my second one. I “try” to write every day (I put “try” in quotes because there are many days when it just isn’t possible, for a variety of reasons). I like to write in the morning, when I’m fresh; but I often spend the whole day writing, even into the evening. One thing I learned long ago: you can’t sit around waiting for inspiration; you have to make it happen. I often go to as writers' colony or retreat, and that's my best time - I just work all day and into the evening till I'm exhausted. Writers get stalled, it just comes with the territory. Going for a walk is my best way of loosening the gears. A drive can do it too sometimes. Showers are also good. Ha ha – not really – though I have a “special pen” for making entries in the notebook I use to record work I’m sending out. This is the second time I’m repeating this: art begets art. I‘ve written a lot of poems after reading or hearing poetry, and some after listening to music, viewing art shows, etc. Science, not so much – my mind doesn’t go that way. But nature, of course – it’s probably the single greatest inspiration not just of poetry, but of all art. My fiction is also influenced by other fiction writers. The list is endless – and fluid. Again: The list is endless – and fluid. Well, I was a journalist for years, and still do some freelancing. I loved being a newspaper reporter – most days, anyway. I’ve also done some teaching (both creative writing and journalism) and found that rewarding too. This is a cliché, I know, but: it’s in my blood. It’s who I am, what I do. Munro’s Too Much Happiness, probably; as for movies, I’ve seen a lot of good ones, but no great ones for quite a while. A new story collection and a new poetry collection. But that would probably have been my answer to that question had it been asked at any point over the last 20 years.